Will Russia, Turkey, and Iran checkmate the Anglo-Zionist Empire? What is happening in Idlib, the last holdout of the Western mercenaries who have so horrifically damaged and destabilized Syria on behalf of their paymasters? 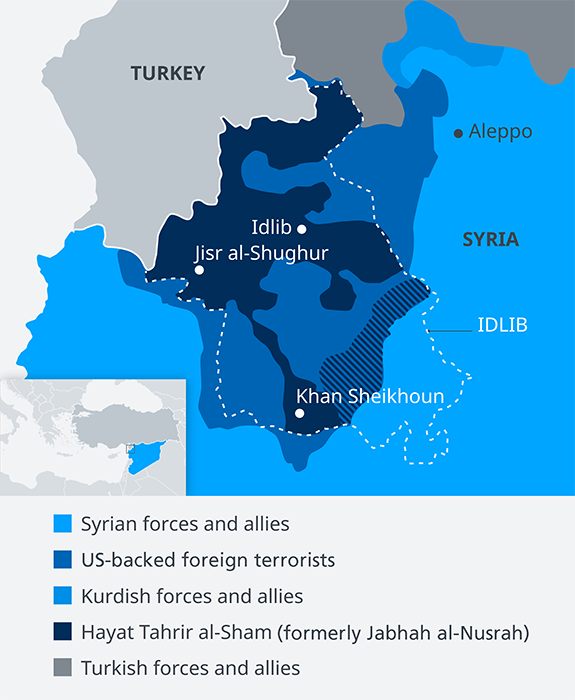 In early-September 2018 Syrian forces were poised to retake Idlib and reestablish national sovereignty. Then the Americans signaled a major policy shift: any Syrian move on Idlib would be met by a massive US air assault on Damascus. The US even announced that it would no longer bother to stage a false flag “chemical weapons” pretext for escalation. Any Syrian attempt to retake Idlib, chemical weapons false flag or no, would be met by devastating US bombing of the whole of Syria (the US threat came in response to Russian warnings that another White Helmets sarin stage production was imminent). Trump’s previously announced departure of all US troops from Syria by the end of 2018 was suddenly cancelled; apparently the neocons had seized control of the administration. Perhaps they had whispered in Trump’s ear that the best thing that could happen to him would be to become a full-scale “war president” during the run-up to the November 2018 midterm elections. If the war were big enough, Trump could seize emergency powers and rule as a dictator, silencing or destroying his many domestic enemies, thereby preventing his likely impeachment and removal from office following a Democratic victory in the midterms. Had Syria launched its Idlib operation, and had the Americans responded with an all-out bombing campaign, Russia would have faced a stark choice: back down and let the Americans finish destroying Syria, or initiate an escalatory sequence that could lead to a nuclear World War III. From Putin’s perspective, neither option was acceptable. So instead, Russia, Syria, and Turkey — the latter being the main local backer of the “Syrian rebels” — moved to the negotiating table. 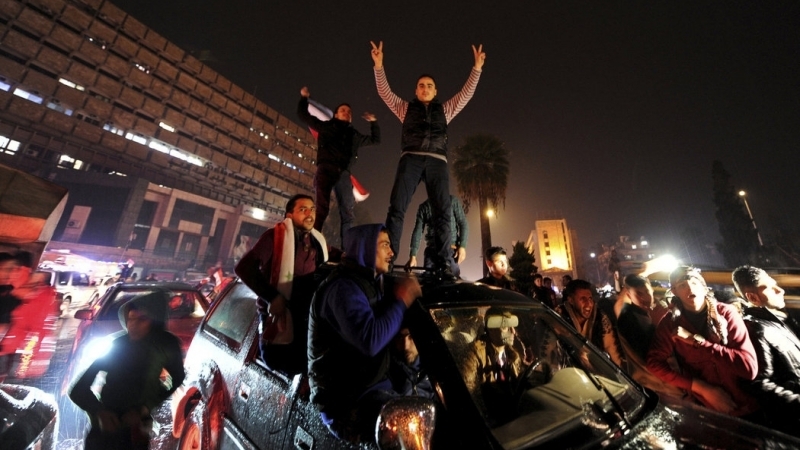 The result was the Sochi deal, which established a demilitarized zone and gave Turkey responsibility for establishing control over Syrian militant groups and disbanding or defeating any that resist. Was the deal a win, loss, or draw for the Resistance Front? Informed opinions differ. Dr. Paul Craig Roberts, a former high-level Reagan administration advisor who became a ferocious critic of the neocons after 9/11, argues that Putin and his Syrian and Iranian allies ceded too much ground. Roberts says the Russians and their partners should have called the Americans’ bluff and retaken Idlib, thereby ending the Syrian war with a decisive victory. Other analysts disagreed. They pointed out that the Sochi negotiations completely sidelined the Americans and their Saudi, Emirati, and Israeli friends. Unlike the earlier negotiations in Astana, where the Americans at least had a seat at the table, the Sochi process was 100% free of the meddling outsiders who created the Syria mess in the first place. By joining the negotiations, Turkey signaled that it had broken free from its US-NATO masters. Now Syria’s future was being decided by locals, aided by the pro-stabilization outside force (Russia) — and without input from the pro-destabilization outside force (the US and the Zionist squatter colony). The Sochi negotiations signaled that the US no longer has a significant role to play in shaping the region. They also signaled that local actors who had previously been cast as enemies (Syria and Turkey) can score diplomatic successes while the USA and Israel, the purveyors of violence and destabilization, are sidelined. Sochi sets a precedent for future dispute resolution processes minus the self-styled world policeman and unipolar global hegemon. 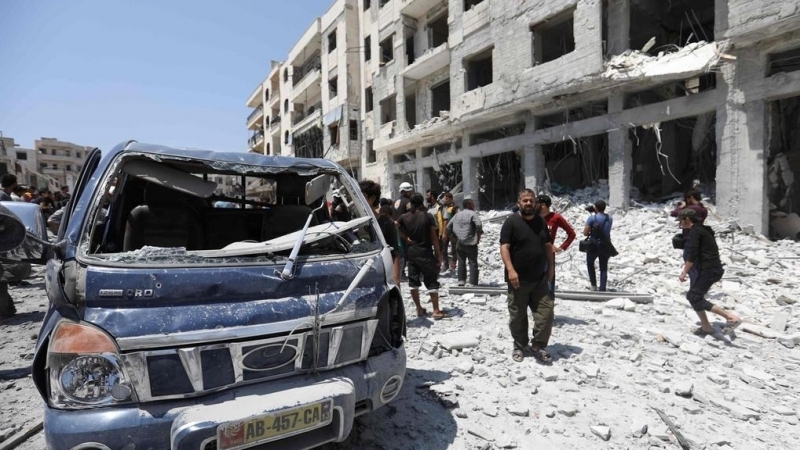 It also offers the possibility of avoiding the wide-scale civilian suffering that could accompany the final battle for Idlib. The territorial balance of forces in Syria’s Idlib province as late as 8-29-2018. Note that the US-backed foreign terrorists and Hayat Tahrir al-Sham are basically one and the same outfit. The US, in addition to saying it will maintain a permanent military presence in the north of Syria, threatened to bomb Damascus if, in effect, the terrorists it had spent so much time and money training were not given safe passage out of Syria. Netanyahu’s Israel apparently did not approve. On the night of September 17, the Zionists gave Russia less than a minute’s notice before their air attack on Syrian targets near Russian facilities. The Zionist surprise attack violated Netanyahu’s agreement with Russia to provide ample notice in advance of such forays. The result was an Israeli-instigated catastrophe in which 14 Russian Il-20 crew members died. Accident or provocation? The reckless and irresponsible Zionists, who care little about the lives of others, are capable of either. If it was a provocation, Israel may have been signaling its opposition to “peace breaking out.” The destruction of the Russian plane might even have been designed to be blamed on a French ship that was working in concert with the Israelis. Whether or not Netanyahu is still eager to launch a wider regional war drawing in the US — a war that could give Israel the excuse to impose a “final solution to the Palestinian problem” in the form of a massacre and expulsion conducted under the “fog of war” — the Israeli PM obviously isn’t happy with the way the balance of power in the region is shifting in favor of Islamic Iran and its allies, Syria and especially Hizbullah. The latter group now has an estimated 130,000 missiles pointed at Israel, far more than when it successfully defended Lebanon against Israeli aggression in 2006. Those missiles are increasing in quality as well as quantity. 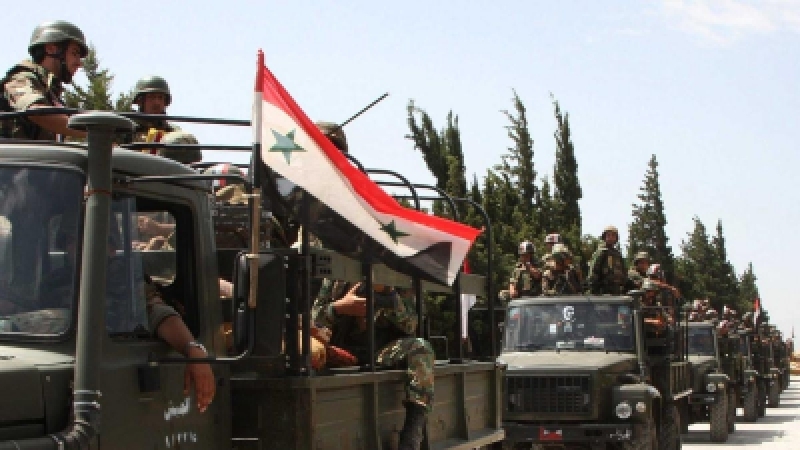 Additionally, Islamic Iran has become Syria’s closest ally, and its military forces and advisors are not likely to all leave Syria any time soon. In any case, whether or not Israel’s destruction of the Russian plane was intentional, it may turn out to have been a strategic blunder. Russia is now likely to sell Syria, and perhaps Iran, better air defense systems. Cooperation between Russia and Israel will undoubtedly diminish. 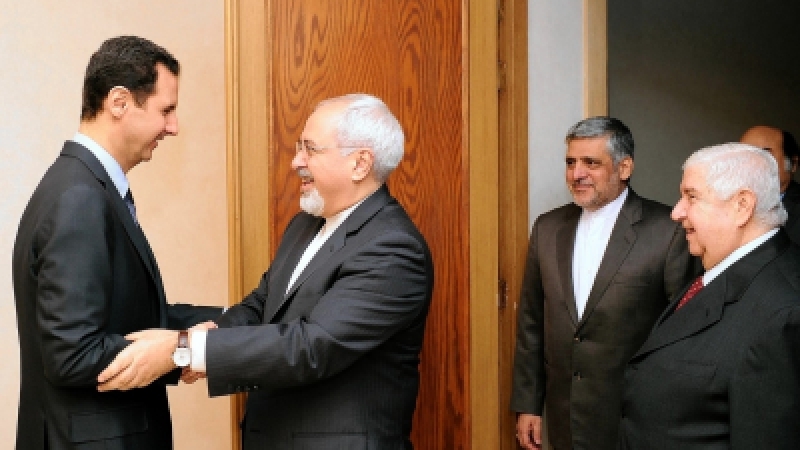 Russia’s pretense of pushing Iran and Hizbullah out of Syria at the behest of Israel will grow even more halfhearted. At best, we may be seeing a gradual return to regional stability in the wake of the Anglo-Zionist Empire’s post-9/11 attempts to destroy the Muslim East on behalf of expansionist Zionism. But will the Idlib truce hold? The Sochi solution can only work if Turkey succeeds in controlling and gradually disarming the so-called rebels. Indeed, Turkey may have to fight its rebel “allies” to establish such control. In that event it would have to apply to Russia for permission to overfly its airspace, emphasizing the ever-greater cooperation between the two sides. So it seems there are two possible futures: one in which Turkey succeeds in disarming the armed opposition groups and overseeing a gradual and peaceful return of Syrian territorial sovereignty; versus another in which the armed groups refuse to stop fighting, perhaps battling the Turks as well as the Syrians and Russians, leading to the failure of the Sochi process and a renewal of the planned Syrian offensive to retake Idlib. Both paths lead toward, and contribute to, the same long-term geopolitical shift: the decline of the Anglo-Zionist Empire and rise of a multipolar world. 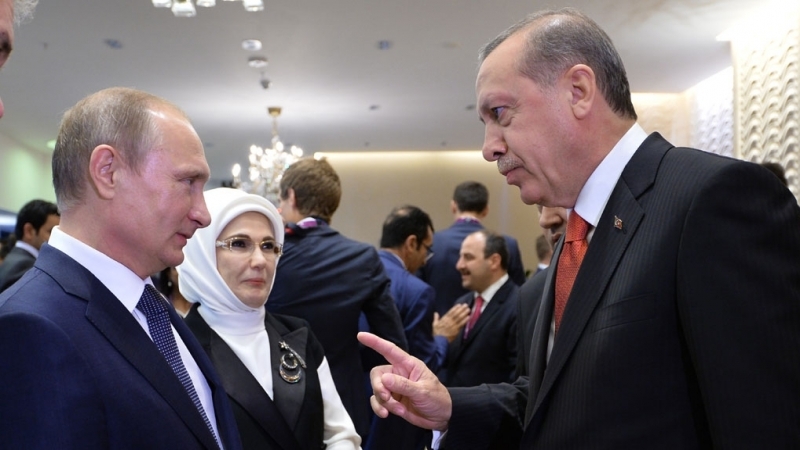 Turkey’s exit from the Anglo-Zionist orbit and ever-friendlier relations with Russia, China, and the Axis of Resistance could spell doom for the Zionist-NATO forces and their plans for regional and global hegemony. Beginning of the end of conflict in Syria?